It’s pretty common now to see a local restaurant post Yelp reviews or Zagat ratings on their storefront windows, showing the number of stars they got or positive reviews gathered as a sort of social proof for consumers making a decision on where to dine. Want Thai food tonight? Yelp reviewers rated us the Best Thai of San Francisco — therefore, we must be good. So what’s the equivalent if you go to buy something like shoes or a dress? What’s the social proof when it comes to commerce? Nordstrom is trying out a new way to highlight the popularity of certain products with Pinterest, tagging some of its most pinned items online in the store with the Pinterest logo. It’s one way of trying to tell consumers: This is popular, and here’s how we can prove it to you. The company has posted photos of the in-store experiments on both its Facebook and Instagram accounts. So far, it’s only in select stores, but it’s interesting to ask whether you’d be more likely to purchase something if you knew that it was popular among Pinterest users. 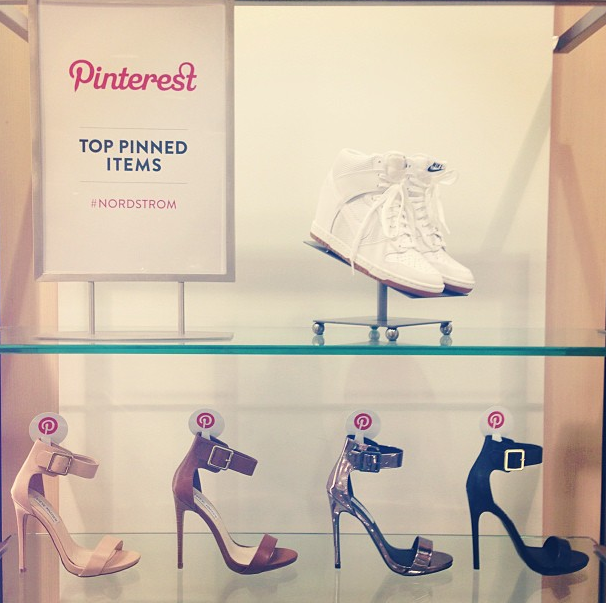 We’ve written about how Pinterest is gearing up for a major monetization effort by partnering with big brands; the Nordstrom example suggests that there probably some interest from the brands as well. Nordstrom is really hitting it. And they’ll all jump onto the bandwaggon until the next hype. I wonder how they’ll go about labeling their Etsy Wholesale handmade merch? Tagging it with Etsy’s logo (which, in turn, will be becoming a sort of a “fairtrade” label)?